Sigma is an open standard for rules that allow you to describe searches on log data in generic form. These rules can be converted and applied to many log management or SIEM systems and can even be used with grep on the command line. In this article I’d like to give you a brief practical introduction into the rule creation process. I’ll recommend some tools and draft a guide that helps you to write Sigma rules as quick and sound as possible. 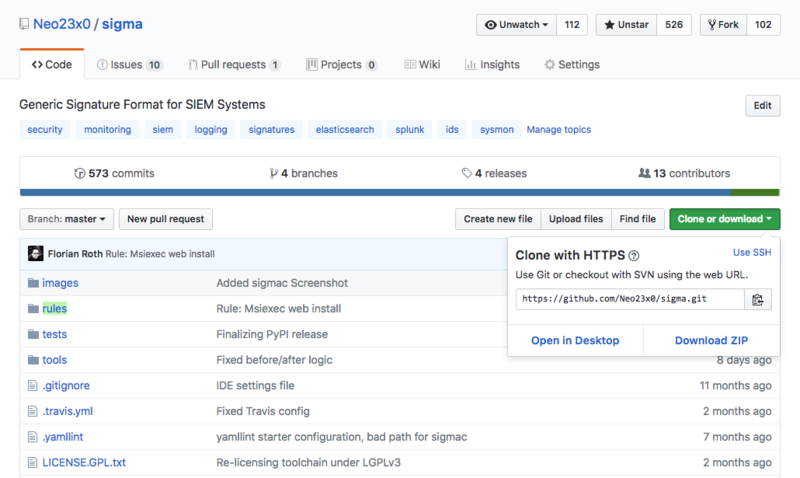 First download or clone our Sigma repository from Github. It contains the rule base in the folder “./rules” and the Sigma rule compiler “./tools/sigmac”. We will use the existing rules as examples and create a new rule based on a similar existing one. We will then test that rule by using “sigmac”. 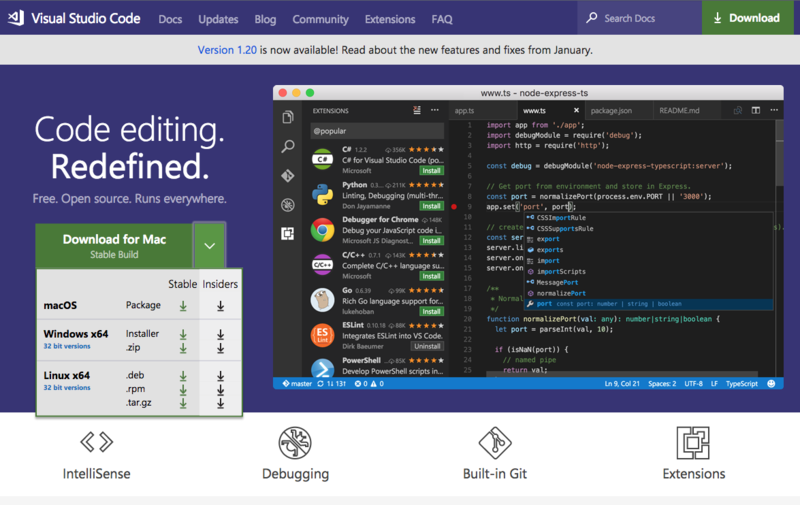 I used the following extensions but I don’t know if they are still necessary. 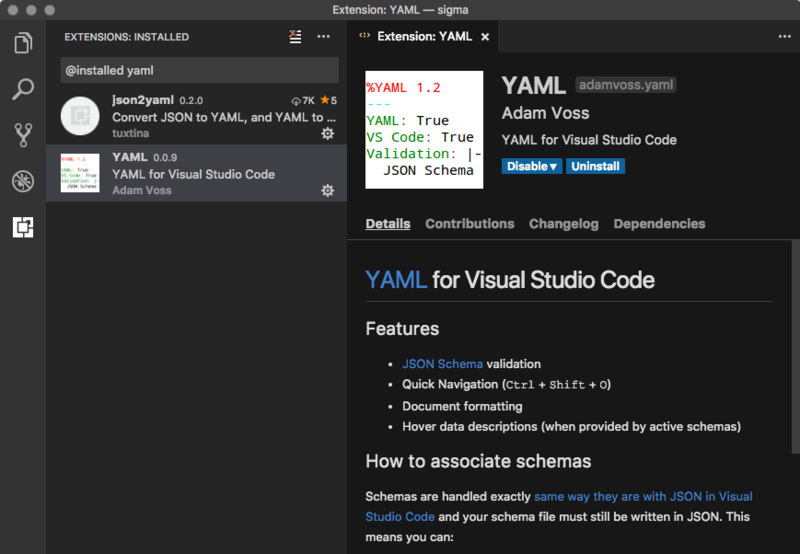 VSCode has improved a lot over the last 12 months and it is possible that it supports YAML highlighting and syntax checks by default now. We open the Sigma repository folder with “Open …” and see all existing rules. I selected an example in which we will create a Sigma rule from one of @JPCERT‘s findings in their awesome “Tool Analysis Result Sheet“. 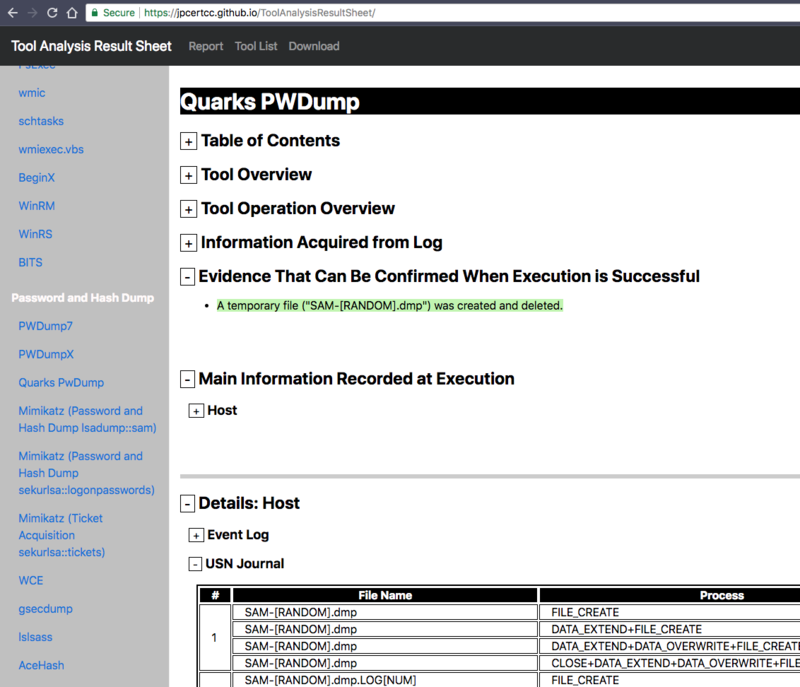 We open the results for “Quarks PWDump“, a password dumper often used by Chinese threat groups. 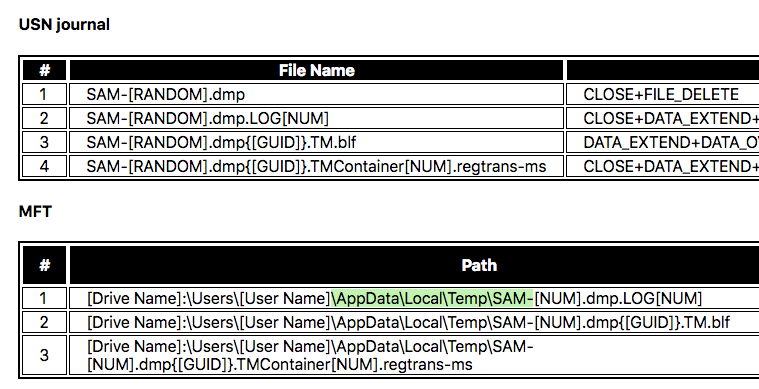 It creates temporary files that we want to detect in our SysInternals Sysmon log data. To collect the needed events we use Sysmon with @SwiftOnSecurity‘s Sysmon config file, Windows Event Forwarding or NXlog. So, what we do is to find a Sigma rule in the repository that we can use as a template for our new rule. We use the ‘search’ function to find a rule that looks for “File Creation” events (EventID 11) in Sysmon log data. We find a rule that has a special format. 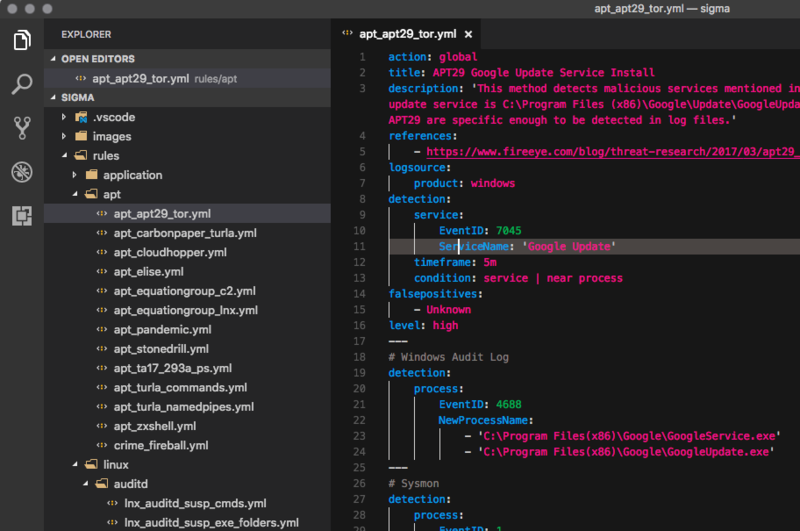 It is a so-called “rule-collection“, which allows us to define a global section in the YAML file marked with “action: global” that will be applied to all other sections in that file during the search query generation process. This way you can define and create multiple search queries from a single YAML file. 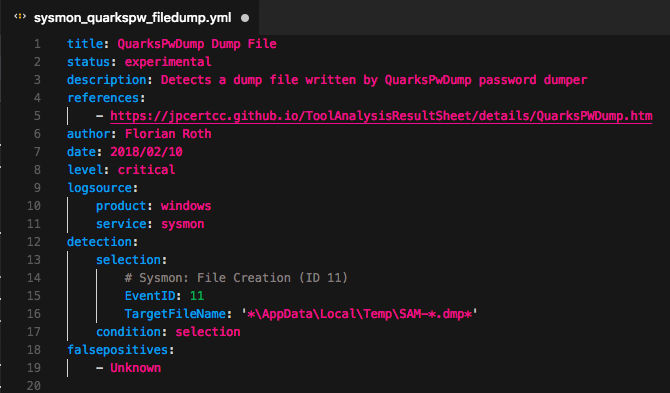 In the case of our QuarksPwDump example we don’t need a rule collection, so we reduce the rule to a standard rule that contains a detection expression looking Sysmon Events with Event ID 11 and save it as “sysmon_quarkspw_filedump.yml” to a new file in the folder “./rules/windows/sysmon/”. Before we create the new “detection” section, we review the analysis report in detail. We test our newly created rule with “sigmac”, which requires python3. It is located in the “./tools” folder. It features several targets for which we can create searches/configurations from our rules. 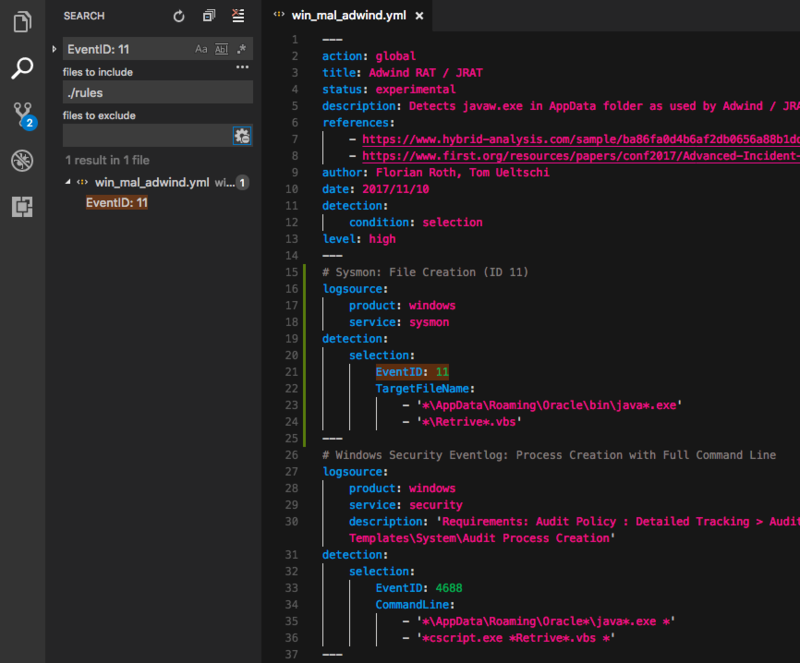 Convert Sigma rules into SIEM signatures. source specifications are AND linked. 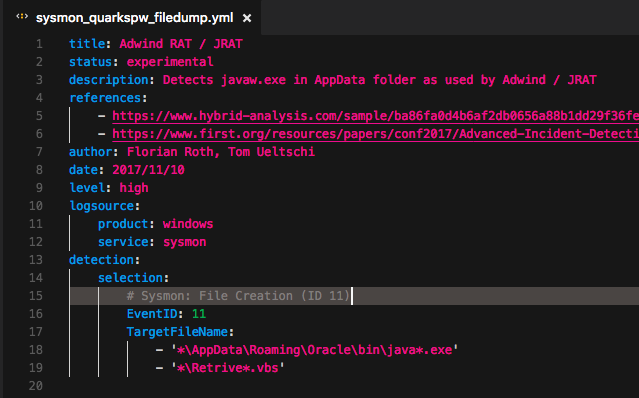 We test our new rule with “sigmac” and the target “splunk”.